“Temptation”-“The Lady and Hooligan” in Azerbaijan State Academic Opera and Ballet Theatre buy tickets online. Delivery of tickets for the event “Temptation”-“The Lady and Hooligan”. Sergey Prokofyev composed the “Classical Symphony5’ in 1917 along with two sonatas and the final of the First Violm Concert. It is not asccidental that the most differins ballet-masters advert to the music of “the Classical symphony” with pleasure the ballet to this music has a success m repertoire of the Moscow State Academy of Choreography staged by Lomd Lavrovskiy. In St. - Petersburg the music of the symphony has fascinated the ballet master Alexander Polu- bentsev. 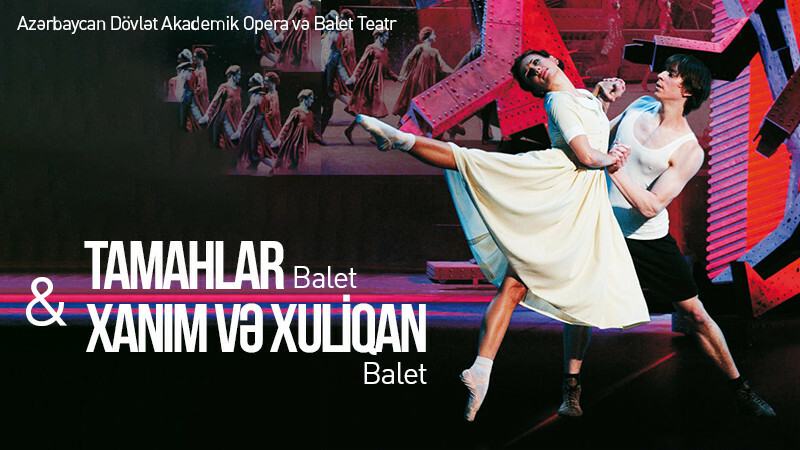 In 1964, the one- act ballet was premiered on the scene of Azerbaijan State - Academic Theather of Opera and Ballet by Leningrad ballet master Konstantin Boyarskiy. The per- fomance was an adornment of repertoire for a long time. The originality of an individual style of the twenty five years' composer is shown already from the first steps of the symphony. The happy Allegro (the first part) files by single breath with the violent vortex. The vivacity, the mischief - m the capricious harmonic plays, by which the simple “Haydn melodies” are adorned. The second part-the admiration by the elegant grace of the old minuets. The ritual of the delicacu of a dance is performed according to all existing rules, but without mockery, the young joker observes funny each bow each curtsy of the affected and a bit ceremonius performers. The charm of the well-known Gavotte (part 3) - in combination of the general simplicity of a melody and the necessitu of its seperate curves, the banality of the correlating triads and the sharpness of their tonal correlation. In the sparking music of Final (part 4) the grains of humor bu Prokofyev are generously thrown about. According to principle of the counterpoint, the author of a new reading of the score of sumphony, the ballet- master and the stage manager Alainm Amber (France) put the philosophical and dramatic content into it. There is not any expressed plot in the spectacle. The music became a cause for the ballet-master to think about the difficulty of the existence, the necessity for men at the turn of millenniums to fight for survival, the problems of the spiritual and physical existence of a man. This story tells about the human instinct, the supremacy of love, the passion and the furious desires between the man and woman. The love, the passion and the beauty are the main sources of life - the ballet master resolves just, exactly m such a manner the concept of the ballet. "The Lady and the Hooligan"
A roast young man rules one of the streets of the city - Hooligan. Unknown lady attracts his attention. The hooligan realizes her as his new teacher at school. She bravely stops him- a dissolute hooligan. The hooligan wants to confess the lady about his feelings in the park, but she runs away in fear. The Hooligan carouses with friends in the restaurant. The lady appears on a vision for the young lover everywhere. He runs towards a direction of her illusion. The Hooligan is by the lady’s house. In the park the drunken young men drive away the people walking in the park. The Hooligan defends the lady and her friends. The lady listens confession of her defender. But ex-ff lends of the Hooligan revenge him. Fatally injured in fight, he approaches the lady’s house. The Hooligan dies on the lady’s arms.